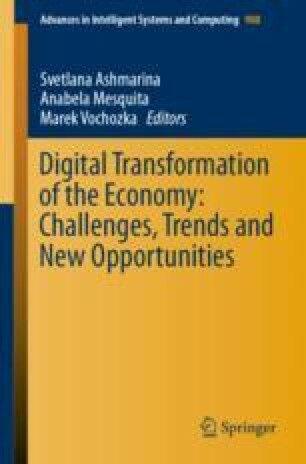 Topicality of the research based on the statement that modern Economy changes rapidly according to consumer’s requirements and technology progress: informational technology, robotics, Internet technologies, business automatization, AR and VR technologies and others. These conditions called Digital Economy or Industry 4.0. It provides a huge amount of requirements to Supply Chain Management (SCM) by rising expectation of consumers to service level and delivery time. In this regard, this article aims to disclose an importance of the informational technologies in the sphere of logistics. That was noticed in the 1970’s while an information and data rate become a competitive advantage. Since that time technology’s progressed deeply and nowadays Intelligent systems transform a paradigm of business and Supply Chain. The leading approach to the study of this problem is synthesis of the different researches views and practice analysis allowing a comprehensive review of the actual informational technologies in SCM. The article presents challenges facing the SCM Industry, disclosed the Internet of Things in SCM definition, discovered that IoT-based SCM take a middle part between customer IoT and Industrial IoT. The materials of the article are of practical value for the Internet of Things applications in SCM.